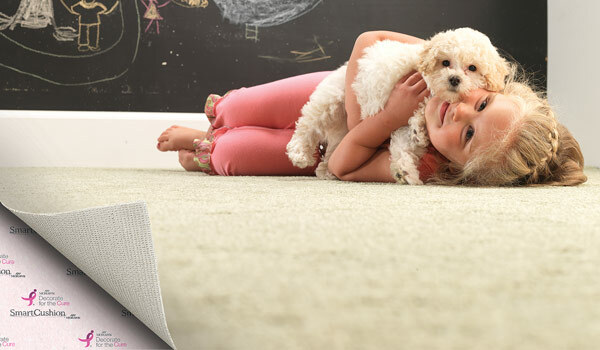 A stunning appearance, remarkable softness and superior fiber construction of our SmartStrand™ carpet and our Wear–Dated™ carpet has earned rave reviews from satisfied homeowners. In our efforts to provide you the best all–around experience possible, we have gone one step further. Mohawk SmartCushion™, our own engineered carpet cushion, adds even more comfort to your home by enhancing both the feel and performance of your already astounding Mohawk carpet. For starters, SmartCushion is made from a combination of ViscoElastic Memory foam and premium white urethane foam to produce a cushion as tremendously soft as it is durable. 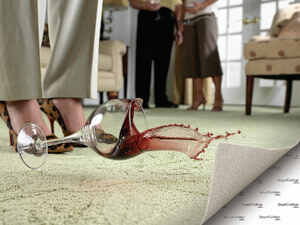 Additionally, the Spill Safe moisture guard keeps spills from seeping into the cushion. No more re–emerging stains; clean–up is a “one–and–done” process with SmartCushion. Plus, there’s no need to worry if spills are not treated immediately:antimicrobial additives to the moisture guard inhibits the growth of mildew, mold, and fungus. SmartCushion’s deep foam construction creates quieter, more energy efficient rooms by improving your carpet’s sound insulating qualities. Superior Insulation Value (2.1), Sound Transmission Class rating (54), and Impact Insulation Class rating (72) means a more peaceful, tranquil setting where you desire it most — the home! As a CRI Green Label product for air quality, SmartCushion is also a shining example of our mission to better the planet while improving your quality of living. Made from recycled foam trimmings, our environmentally–friendly cushion is non–allergenic and contains 90% post industrial material. And we haven’t even begun to explain how Mohawk SmartCushion extends the life of your Mohawk carpet in the form of the ultimate warranty upgrade. We’ve got you covered figuratively and literally — SmartCushion is no exception!